Nyan cat is a cat with a poptart for a body who flies across the sky followed by a rainbow. This animation is accompanied by a sped up annoying Japanese pop song where the only lyrics is “nyan” x infinity. The rainbow scarf is made from two rows of double crochet per color and is approximately 70” long. The face is kinda-sorta embroidered on. In the process of making this scarf, I also learned the art of sewing things together without being able to see the seam on the other side. 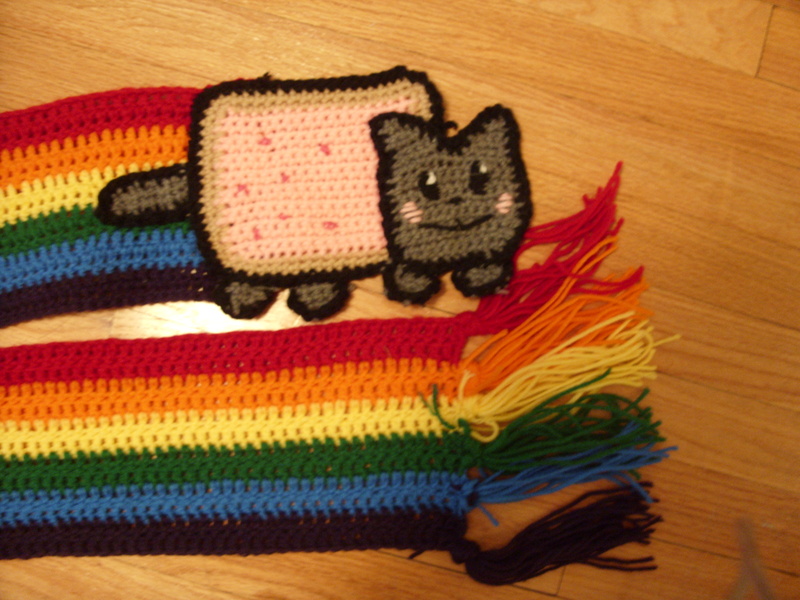 For example, to sew the cat onto the rainbow, I used black thread which wouldn’t be visible on the front side, but would be visible on the other side if I sewed all the way through. So instead, I sewed into the front part of the posts and loops of the double crochet instead of wrapping the yarn around the entire stitch like I would usually do. Every person who sees this scarf has told me they want one, so I’m currently attempting to replicate the pattern. I’ll try to post the pattern once it’s finalized.